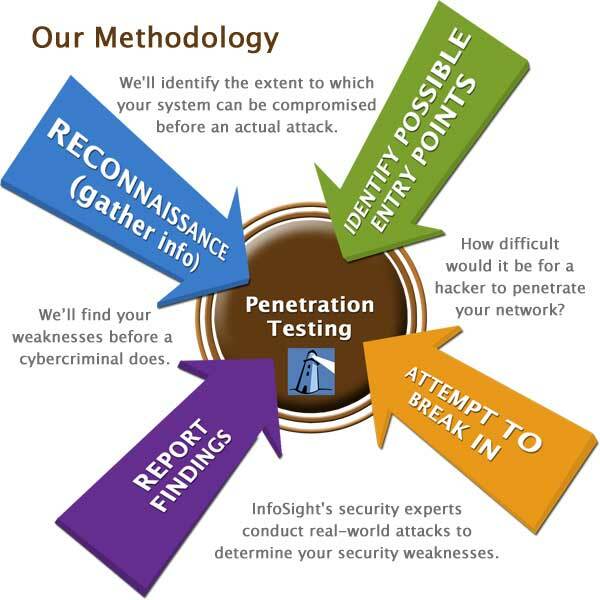 InfoSight's security experts conduct real-world attacks to determine your security weaknesses. Our extensive knowledge of the most current attack vectors, along with our experience in the financial services, insurance, healthcare and utilities industries, will provide you with the assurance and confidence you need to concentrate on your business rather than on your network security. Penetration testing is a method of evaluating a computer network, software, databases and/or web applications to find vulnerabilities and attempt to exploit before a cybercriminal does. Penetration testing is required for PCI-DSS and FFIEC compliance. The main objective of penetration testing is to identify security weaknesses and test how far a potential exploit can compromise the network. We'll identify the extent to which your system can be compromised before an actual attack. A penetration test can also be used to test your security policy compliance, the effectiveness of your employee security awareness training and your organization's ability to identify and respond to security incidents. What's the difference between a penetration test and a vulnerability assessment? The difference is the attempted exploit. Unlike a penetration test, a vulnerability assessment just identifies the vulnerabilities and makes remediation recommendations. Let our experts analyze your system to determine your security weaknesses before a cybercriminal does. Contact us today.